We will conduct a cross-sectional survey by door to door interview. This home visit interview will be performed by trained enumerator who will collect data on the health care facilities utilization pattern and perceived severity of ILI in the community using a pre-tested questionnaire. Socio-economic status such as education and occupation of household head, household size and structure, house condition, assets ownership, and health insurance status will be collected as well. The association of these variables and health care seeking behavior will be analyzed. Existing household databases from CIRAI and the high resolution map of the study area will be used to locate the randomly selected study households. The existing high resolution map with road network will be used to measure geographical accessibility of puskesmas from the house of respondent. All surveyors will be trained on how to conduct interview and communicate effectively with the potential respondent regarding the purpose of the study and in obtaining informed consent. Only those subjects who agree to participate and sign the informed consent will be interviewed. The sample will be selected by stratified random sampling with probability proportionate to size. All households will be stratified into 8 categories based on the neighborhood health care utilization rate, neighborhood geographical network distance to puskesmas, and household socioeconomic status. A neighborhood will be defined as a block of buildings that visually appear to be one community cluster without any physical or landscape barrier on the high resolution map using GIS. 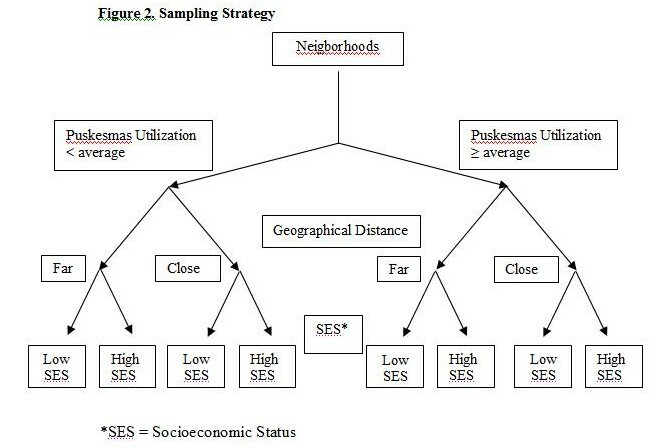 All neighborhoods will then be stratified into 4 classes based on the proportion of population who utilize puskesmas for ILI and the geographical distance between the centroid of the neighborhood boundary and puskesmas (see figure 2.). All household within each neighborhood class then will be stratified based on the household socioeconomic status into two categories. We plan to collect data from about 500 households in the study area, with the target of 90% response rate. This number is calculated based on the 95% confidence level, 80% power and 5% precision, with an estimate that the proportion of population using the puskesmas for ILI is 20%.